Here are some commonly asked questions which may help to better understand vein related issues. A visit to our office along with an exam would be needed to get answers to your specific medical questions. 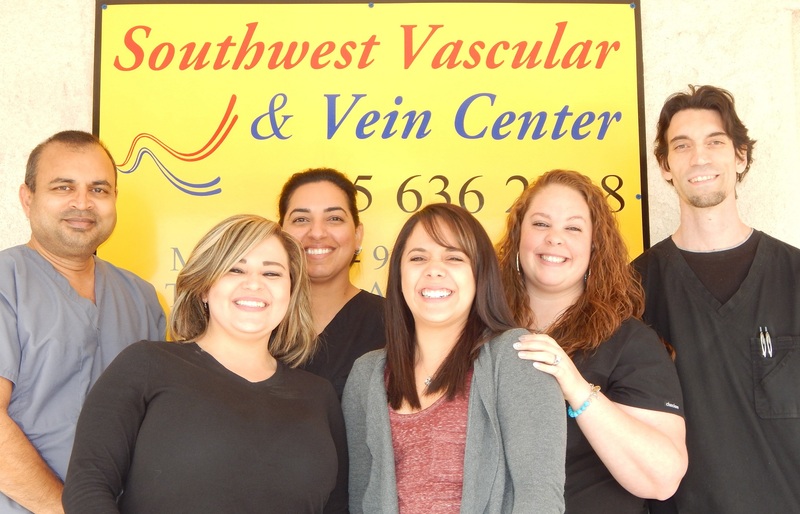 Southwest Vascular & Vein Crew! Q: What causes vein problems? Genetics is the primary cause. You parents / grandparents likely had them. Pregnancy and other stressful situations worsen them. Q: What are symptoms related to vein problems? Most common symptoms are end of the day pain / heaviness, and swelling in legs. Significant other symptoms include itching, discoloration, and restless legs which is most pronounced at bedtime. Q: Will varicose veins go away over time? No, in fact they will get progressively worse without proper treatment. At Southwest Vascular & Vein Center, we address the underlying problem, not just the symptoms, improving your chances for excellent long-term results. Q: Why Southwest Vascular & Vein Center? Dr. Vedamanikam is Board Certfied Physician in Venous & Lymphatic Medicine, a specialty developed especially for those in vein care. He has over 25 years of vascular imaging experience and almost 5 years of vein intervention. He is also Board Certified in Family Medicine. A referral is not required but encouraged. This allows your PCP to be involved in your care and follow along for continuity. We routinely send reports to you PCP for the same purposes unless you inform us otherwise. Q: How soon can I schedule a vein procedure? Almost all insurances require a 3 month trial period of conservative management. For this reason, we request that you see us as soon as possible so that that trial period gets initiated. Q: Does insurance cover any of the vein procedures? Yes, as long as it is not cosmetic. Surface spider veins are considered cosmetic while bulging veins and veins under the skin seen only by ultrasound are not considered cosmetic. Most insurance policies cover costs related to diagnosis and treatment of venous insufficiency. Depending on the type of your insurance and plans, deductibles and copays may exist. Q: Is it true that these methods are painless? Its a relative question based on pain threshold. Certain procedures require a single injection of anesthesia while other require a few. Most patients of Southwest Vascular & Vein Center have considered these procedures painless relative to the relief they got from their symptoms. There are more patient complaints about the stockings than the procedure itself. Q: How much time off will I need after a procedure? None, other than for the procedure itself. The entire procedure takes 30 to 45 minutes after which you can get right back to your work, school, or occupation right from our office. We require you to remain active for the rest of the day as part of your therapy.